A perspective drawing of the new Taco Bell. In recent months, Sunbury Village Council has seen some changes to its lineup, as well as changes to the village. Most notably, council is nearing approvals of a new J.P. Morgan Chase Bank branch and a new Taco Bell, both to be located in the Sunbury Mills Plaza Shopping Center at Cherry Street and state Route 3. 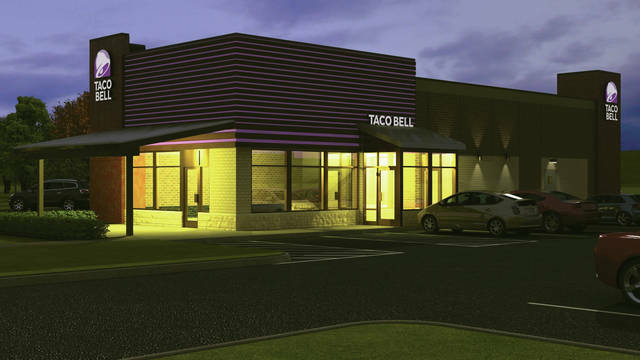 The 2,606-square-foot Taco Bell would be the first in Sunbury and include a drive-through and an outdoor patio. Council had asked the franchisee to change the exterior facing the street to look more like an entrance. The project was approved at the Sunbury Planning and Zoning Commission meeting on Dec. 18, and revised plans were presented on Jan. 12 and Feb. 1. The Chase Bank would be a 3,788-square-foot building on 2.2 acres with a drive-up ATM. The Planning and Zoning Commission approved the plans on Jan. 22 and revised plans submitted on Feb. 2 are under review. Also likely to be approved in a future meeting is the Price Ponds residential development at Golf Course and Cheshire roads/Mill Stone Drive after a public hearing was held on Jan. 17. Price Ponds has had two readings by council. 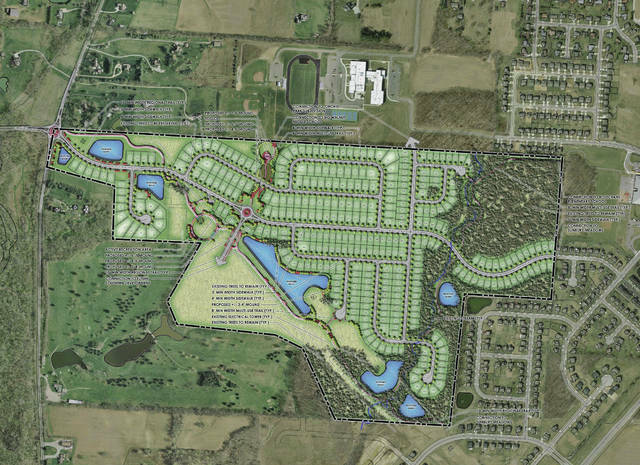 If approved, Price Ponds would be an 184-acre subdivision of 337 single-family homes. In what has been termed as a swap, a heavily-forested 18-acre area in the northeast corner would be preserved and owned by the village. Village officials had hoped to have a promised new traffic signal installed at the intersection of state Route 3 and Sunbury Meadows Drive by the end of 2017. Residents and motorists in the area had also hoped for the new light. Unfortunately, the wait will continue. It was determined that the cost of putting in a temporary signal would be excessive. Another potential development council may be looking at would be an assisted living facility behind the BST&G fire station, which is in the plan review stage. The council meeting on Dec. 20 was the last one for councilman Tom Zalewski. Mayor Tommy Hatfield let Zalewski pound the gavel to adjourn the meeting. Joe Gochenour also left council at the end of 2017 after serving for eight years. There are two new councilmen: Joseph St. John and Martin Fisher. Returning to council are Timothy Gose, Dave Martin, Leonard Weatherby and Scott Weatherby. Also at the meeting on Jan. 17, John Lieurance and Rick Ryba were appointed as new members to the village’s zoning board. https://www.delgazette.com/wp-content/uploads/sites/40/2018/02/web1_Taco-Bell-Perspective-Shot-11-00012-copy.jpgA perspective drawing of the new Taco Bell.